January is almost over. The month of the first year is about to turn into February. Did I accomplish what I wanted to accomplish in January – yes and no. And there is always February to accomplish what I didn’t accomplish in January. I am looking forward to the SuperBowl Sunday. Its the SeaHawks vs the Broncos. Oooh. Both of them are good. I don’t know who I will root for yet. 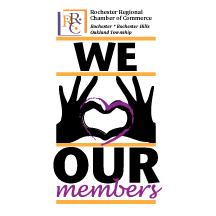 There is quite a bit going on in February and I’ll see if I can list them all here, but first I want to share the “We Love Our Members’ logo changes” – and I think this is the one we’re going to go with. In the month of February, we have our first Ambassador Network Meeting of the year in the beginning of the month. Then we have our Community Outlook Luncheon at the end of the month. The Community Outlook Luncheon is at Oakland University and it is always a good one since it is all about what is happening and what is forecasted for the greater rochester area. (in terms of economics, development, and education). In February there are two art exhibitions that I am excited about. One is at Belian Art Center, on Saturday, February 8th. 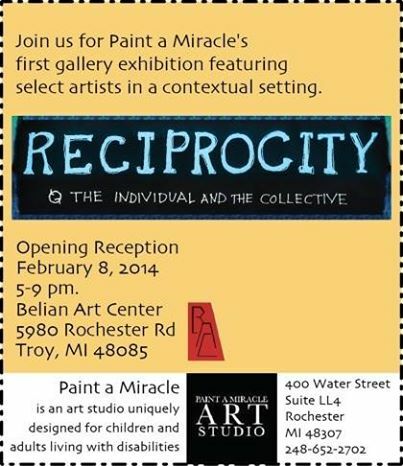 There will be an opening reception featuring Paint A Miracle’s visiting artists and the organizations artists. I am hosting a small dinner party at my house that night in which I have invited ceramic artists and ceramic students, and then afterwards, we’ll all go over to the gallery since it is about half a mile from my house to see the opening reception. Then at Fieldstone Winery, we’re featuring a wonderful upcoming artist from Detroit, Michelle Tanguay. We’re hosting a “closing reception” for her on February 22nd from 6 to 9 pm. I’ll find a photo of one of her works tomorrow. Will send out a email newsletter Saturday. Stopped at a new business called Victoria’s Reserve – was invited to its open house tonight. Very nice turn out. Had dinner. i’ve sketched out a template using Phoebe’s measurements onto a paper bag. Now I’m going to “google” sewing tips.